The GVP-48-2L-LED-DNMS from Larson Electronics is a Vapor Proof LED Fixture with Day/Night & Motion Sensing Capability that provides an LED alternative to fluorescent fixtures while providing longer lamp life and higher performance. The GVP-48-2L-LED-DNMS is similar to our popular explosion proof LED fixtures and provides an LED alternative to fluorescent fixtures that provides longer lamp life and higher performance. These LED two lamp fixtures produce more output with longer lamp life and are vapor proof and impact/ vibration resistant. This vapor proof LED light is ideal for applications such as ships, offshore applications, marine (saltwater) use, manufacturing, water treatment centers, shopping malls, parking structures, and outdoor flood lighting. This four foot long, two lamp LED fixture is ideal for operators seeking a top quality vapor proof light that will reduce operating costs, improve lighting quality and reduce downtime incurred from frequent servicing intervals. The GVP-48-2L-LED-DNMS LED light fixture is designed for use in wet areas and saltwater-marine environments where corrosion resistance is critical to equipment longevity and safety. This fixture is equipped with two specially designed LED T8 style LED bulbs which produce 3500 lumens each and have a color temperature of 5600K, 4500K or 3000K. The GVP-48-2L-LED-DNMS, four foot long, two lamp LED light fixture is designed for those who wish to replace or upgrade from fluorescent equipped fixtures and offers better light output and longer lamp life with reduced maintenance costs. With no ballast and solid state LED light tubes, this fixture draws less than 1 amp of power while offering durability and versatility that common fluorescent fixtures cannot match. 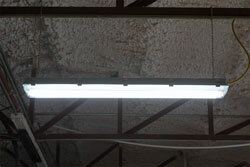 We now offer our second generation LED tube lamps with this fixture which have increased this light`s performance. This two lamp LED linear fixture is lighter in weight and produces more light than hazardous location fluorescent fixtures. The four foot long LED tube design bulbs included with this unit are rated at 50,000 hours of service life, which is over twice as long as standard T8 bulbs. We have eliminated the ballast normally associated with fluorescent fixtures which reduces overall weight and overall complexity of installation. There is no ballast in this unit and the included LEDT8-28W-V1 LED lamps have a 50,000+ hour service life, both of which result in extreme efficiency and greatly reduced maintenance costs. These fluorescent LED lamps have internal drivers, eliminating external power components. The solid state design of the LED lamps give this fixture superior resistance to damage from vibration, extremes in temperature and a lamp service life over twice that of standard fluorescent bulbs. This second generation lamp is offered in 5600K cool white, 4500K natural white, and 3000K warm white. Our standard unit ships with 5600K unless different color temperature is specified. The 28 watt LED lamps produce 30% more illumination than standard T8 bulbs while offering lower amp draw and increased reliability. Each lamp produces 3,500 lumens at 125 lumens per watt, for a combined 7,000 total lumen light output. A four foot, two lamp T8 fluorescent light, with a combined total of 64 watts, draws 0.54 amps at 120 volts AC. This LED version of the same light, with a total of 56 watts, draws only 0.47 amps at 120 volts AC. The GVP-48-2L-LED-DNMS is available in the following voltage configurations: 120V, 220-240V, 12V, or 24V. Please make your selection below when ordering. Sensor Technology: The GVP-48-2L-LED-DNMS is equipped with an innovative and powerful day/night + motion sensor. This sensor, which is located inside the light fixture itself, allows the GVP-48-2L-LED-DNMS to operate in one of several different and versatile modes. This LED light fixture can be set to be motion activated, day/night activated or in a combination of motion sensing and day/night modes. This high-tech sensor is also highly adjustable and allows operators to modify the following settings: motion sensor sensitivity, motion sensor time-delay and the intensity output level of the fixture. Having this degree of flexibility in operation and settings offers operators an incredibly versatile light fixture. Sensor Versatility: The impressive versatility of the motion + day/night sensor found in the GVP-48-2L-LED-DNMS LED light fixture allows for a lot of creativity in the setup of a single one of these light fixtures. However, the versatility is further increased when multiple units are to be installed together such as in a parking garage or other similar structure. Operators can take advantage of the sensor versatility to set up an energy efficient and automated lighting setup. Take a parking garage for example. Operators would be able to set up a sequence of GVP-48-2L-LED-DNMS fixtures with alternating lights on seperate circuits. The first circuit would have sensors set to a lower lux level than the fixtures on the second circuit. This hypothetical setup would allow half the lights to come on as daylight began to fade and the rest of the lights would only come on once complete darkness had fallen. The fixtures could then be adjusted for motion sensing which would allow selected fixtures to power on when pedestrian or vehicle movement was detected and then turn off after an operator chosen interval to conserve energy. This is just one example of the flexibility and versatility that can be achieved with the GVP-48-2L-LED-DNMS. This unit is designed to be either surface mounted or hung from cable or chain and includes built in mounts. The GVP-48-2L-LED-DNMS light fixture is ideal for indoor-outdoor applications and suitable for use as general area lighting, shop lighting, work space lighting, garage and warehouse lighting, and anywhere a rugged and dependable fixture with high output and efficiency is needed. This light comes with a multi-purpose mounting bracket that can be used for a direct surface mount or reversed and used for chain hanging the unit.